They don’t work because people don’t work according to linear, sequential processes. They can’t. From the early 90’s on, the business world went business-process. The entire SAP industry is based on the idea that work has to be organized according to business processes. Companies that are considered well structured are (supposed to be) “process oriented”. But since 1990, a lot of things have changed. In the last half decade or so, the world went completely different and suddenly, being process-driven is not – or not only – enough. What do I mean? 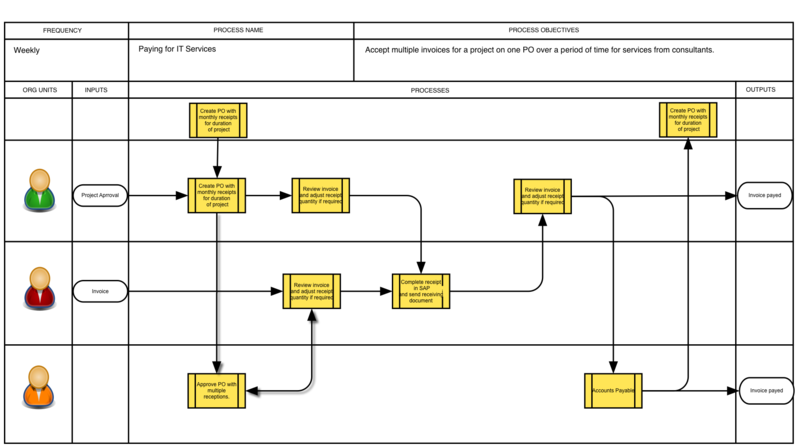 You must be familiar with business process diagrams that look like flow charts with boxes and arrows distributed on swim lanes – they’re really pretty. Do people follow them? Seriously – do they?! In my experience in so many projects creating just such pictures, what I found – systematically – is that people look at the diagrams, they learn them, they learn the associated procedures and so on and then they move on, never to look back. They work the way they work, they follow the principles, use the tools, use the techniques, but they don’t work according to the diagram! I know companies that struggle to have their people “follow process”. Some invest enormous energy creating extremely detailed procedures, even set-up audits to see if everybody is following procedure. Does it work? Not really. Let’s face it, people don’t work according to the beautiful linear, sequential picture on the wall. And they don’t because it’s not natural – reality is not linear, reality is very fast and changes all the time. It’s just not possible to work in an Operation subject to a fast-paced environment, with lots of surprises and changes in requirements and still follow the pretty picture on the wall. In the past two years, working with social networks in the workplace of various organizations, I was able to evolve an approach to help people follow principles and rules without strapping them with linear procedures. The goal in this approach is to get people to work in Now Mode. What follows is an outline if a simple method to get people away from unrealistic linear processes towards working in Now Mode. And this approach is called “Event Driven Operations”. How does it work? Business processes don’t work and yet they are needed. Let me explain: what business processes (particularly if they are integrated) do is that they provide coherence. They translate what a company does into a coherent structure of tasks. But the reality is that in a company with structured processes what people do, all day long, is that they execute parts of processes in multiple, improvised sequences. So, what’s wrong with linear processes is not their essence, it’s their sequence (that’s why I said “linear”!). Now imagine that you remove the rigid sequence of business processes and keep only the clusters of tasks that need to be done together by a person on a specific Role. For instance, if you are receiving a delivery from a supplier, you will have to go through a few steps to do that reception: scan the label on the palette or parcel; check the label against the PO in the system; verify documentation; etc. These small steps have to be taken to do a thing called “receive a PO”. Thus, “receive a PO” is one of these indivisible clusters of tasks and is assigned to a person in a Role – in this case, it could be a Reception Technician. 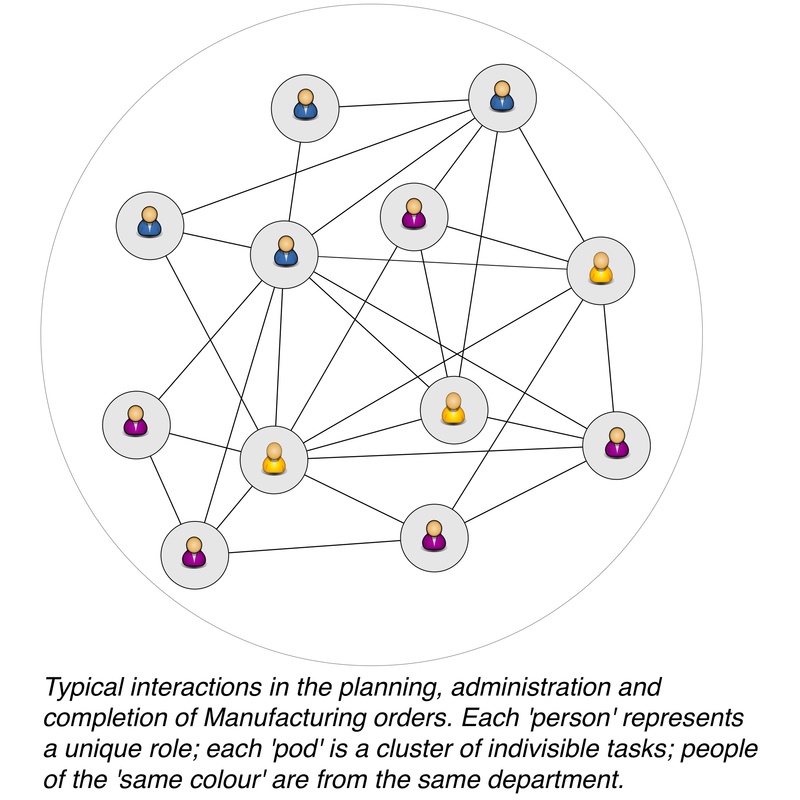 There are many clusters like this and they all come from established processes: replenishment planning, demand planning, production scheduling, production order closure, goods reception, etc., etc. – each one of them probably the competency of a particular Role. Now let’s assume that we don’t impose a sequence, that there is no policy establishing sequence. There are constraints – e.g. you can’t receive a PO that was never issued – but there is no sequence. Now we are going to place people in a social network where they can ‘see’ each other, i.e., they can easily reach out to each other. And now we ask them to work event by event and not accumulate anything. For instance, if there is an incident in the production line where a batch of something is being manufactured, they don’t put the batch aside and let Quality Assurance deal with it later. They post the incident on the social network and immediately other people affected by the incident start reacting, according to their Roles and competencies. And they keep going until the incident is dealt with – no delays. You see, in this example, the sequence in which each Role intervenes – Line Operator, Supervisor, QA associate, Supply Chain Analyst, etc. – is improvised spontaneously by these individuals. It’s very fast and is always the right action path because they are all competent to perform those Roles. Let’s see another example: a competitor went on Backorder and the demand from the market that used to ‘go’ to that competitor is now coming to you. You experience a sudden increase in Demand. What happens? The demand surge incident gets posted in the social network; product managers and demand planners start quantifying the problem; supply chain folks start talking to suppliers and plants; customer service starts preparing for the impact of shortages; and the reactions continue until the situation is under control. What I’ve described is an Event Driven approach and leads to an Operation working in Now Mode. Events can be incidents as I just mentioned or they can be more mundane. For instance, if a batch just finished being manufactured, QA comes down and reviews documentation; warehouse technicians receive the goods; production supervisors close the order; supply chain gets an update; customer service gets an update; the Lab knows that they have to get the sample analysis ready; etc. Reality rarely functions according to the pretty picture on the wall. Sometimes an increase in demand exceeds capacity, sometimes it doesn’t; sometimes we have to figure out which product to compromise; sometimes we have an impact on the customer sometimes not; sometimes QA finds problems with documentation and it needs to be revised; sometimes inventory is building up and it exceeds working capital controls; and so on. People of diverse Roles working in a social community improvise action pathways very quickly to deal with every Event – whether there are problems or not. An Event Driven Operation is the most responsive and adaptable form of organization there is. Recently, I had the immense pleasure of implementing one such model and witnessed the incredible results achieved by the community. You should try it. It’s immensely fun and so liberating.